An image of Christ with one hand raised in blessing and the other supporting a richly bound book containing the Scriptures. 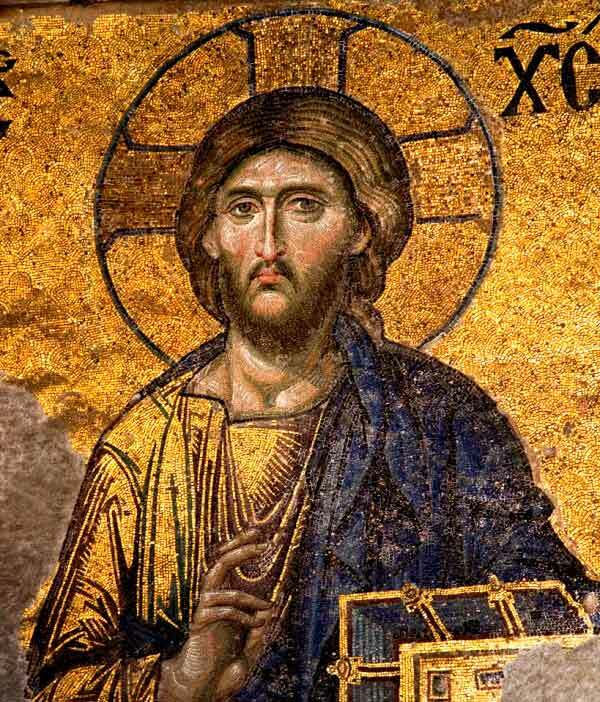 This is from the Hagia Sophia, with Christ as the personification of Holy (hagia) Wisdom (sophia). Hagia Sophia was essentially an imperial building, the personal church of the Emperor and his court, rather than a place of worship for ordinary people. So Christ is shown in all his glory. But he is human as well: there is subtle shading in the cheeks, neck and right hand of this image. His humanity is emphasised by the deep eye sockets, bags under the eyes and the downward curve around the mouth. This is a kingly Christ, one who sees all the good and evil in human beings and yet loves them. 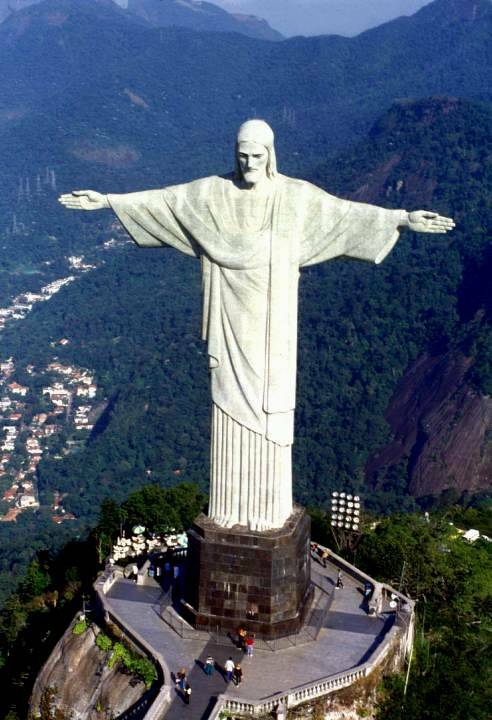 The statue of Christ with open arms is a worldwide symbol of peace, recognised by believers and non-believers alike. Christ, visible to all who will look up, opens his arms to anyone who comes to him. Here is a face that is energetic, full of hope, idealistic in the best way – everything that Christians believes Christ was, and everything each Christian tries to be. The man in this image believes anything is possible, and that we are capable of reshaping the world in God’s image. 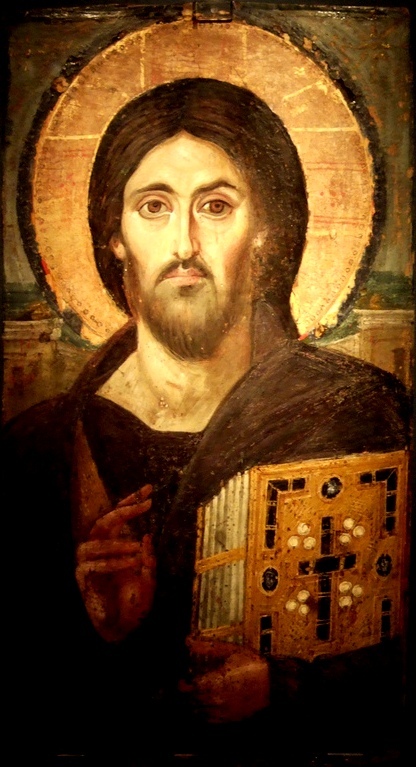 This icon, from a monastery on Mount Sinai, is the oldest known image of Christ Pantocrator. 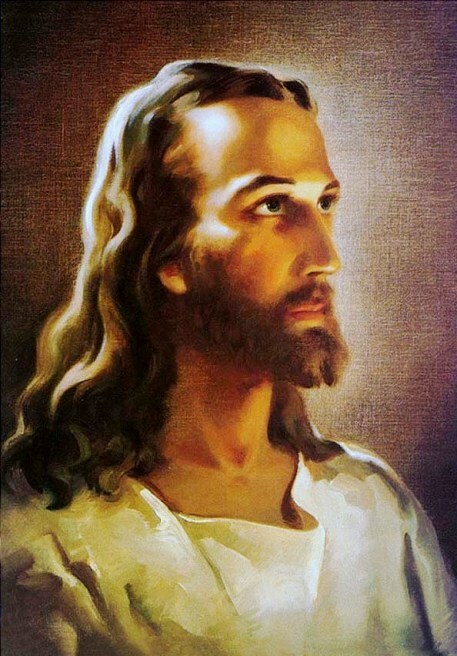 Notice that the two sides of Christ’s face are markedly different to each other. This is said to symbolize the two different natures of Christ: Christ is both truly human, and truly divine, in the one person. 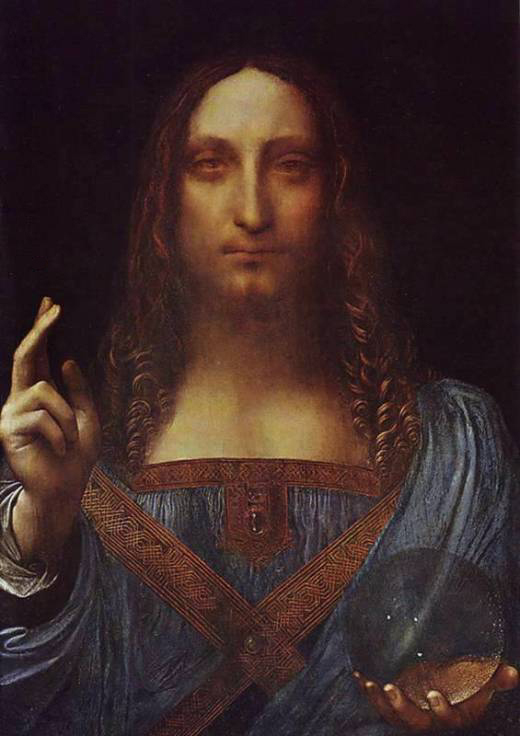 Christ’s right hand is raised either in blessing, or in the traditional gesture of a teacher. He holds a richly decorated book; the cross on its cover tells us that it contains the Gospels. He is simply dressed but majestic. 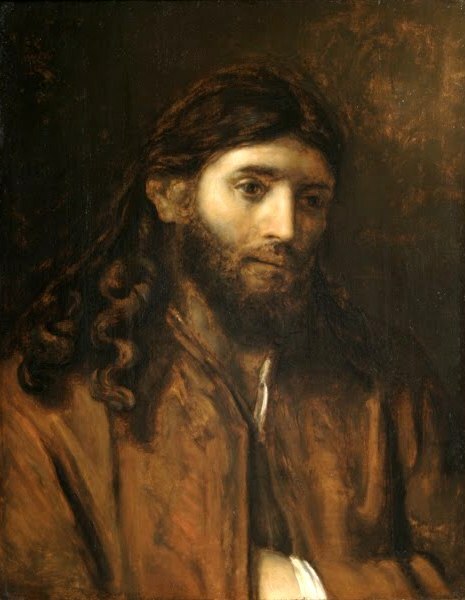 Rembrandt painted a number of portraits of Christ, of which this is one. 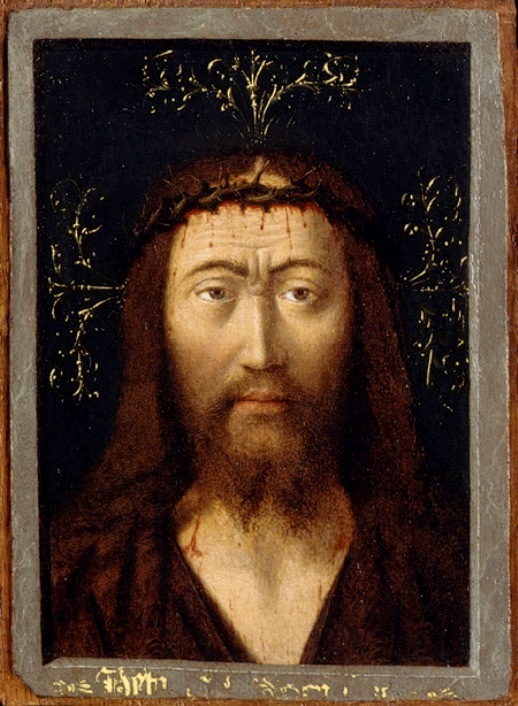 All of the paintings show a sombre, pensive Christ. He is bearded and in the workaday clothes of a medieval artisan. 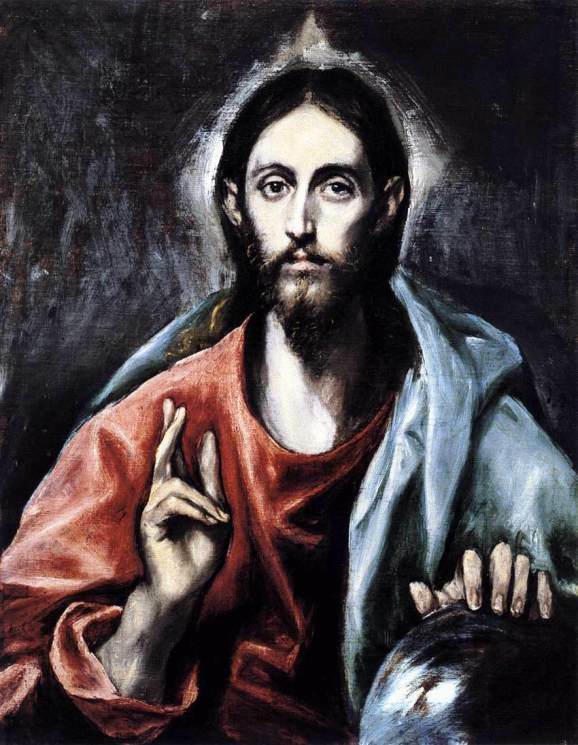 Compare Christ’s right hand with the image of Christ Pantocrator above. The gesture is the same. But instead of a richly decorated book, the figure of Christ in this painting holds a glass globe, symbol of the earth itself. The authenticity of this painting is being hotly debated. It may or may not be a genuine Leonardo da Vinci. The painting does not have the Mona Lisa’s smile, but the figure has a similarly steadfast gaze, and there is the same immediacy and slightly unnerving challenge in the eyes. 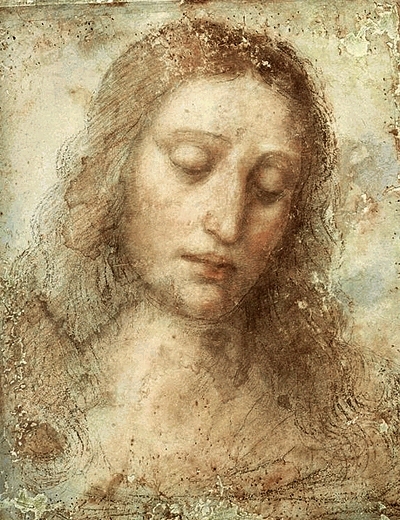 The face of Christ, taken from da Vinci’s Last Supper, is inexpressibly sad. Surrounded by friends, he is aware that death, and a horrific death at that, is only hours away. 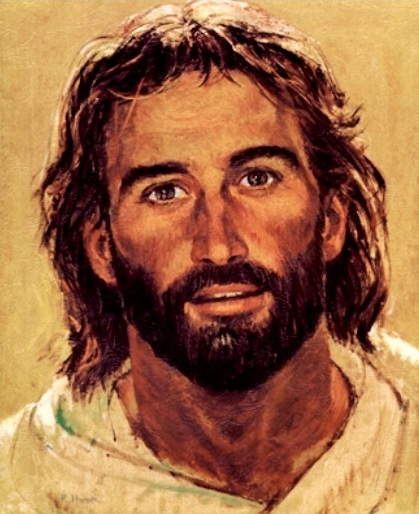 This is an extraordinarily popular images of Christ, said to have sold over 500 million copies. Sallman’s Jesus is serene, thoughtful and visionary. His mouth is set in a firm line, as if he sees his grim future and accepts it. Many families have used this painting to remind themselves that Christ is present in their home and their hearts. The reproachful eyes of Christ look out with an uncompromising gaze, seeming to ask the viewer ‘Why?’ Petrus Christus, who painted so many gloriously frivolous angels and saints, does not even try to sugar-coat the message here. He lays the blame for Christ’s death squarely on our shoulders. This painting was first exhibited in 1854, and caused an immediate sensation. As in ‘The Scapegoat’, there is meticulous care for detail. Nothing is suggested or left out. Branches and flowers are positioned with care, and each has a symbolic meaning. No artist since Blake put so much zeal into his work. But whereas Blake was a mystic, Hunt’s message was straightforward, to the point. His moral and devotional feeling impressed the crowds who came to see his paintings, many of which had a Christian message. In ‘The Light of the World’, Christ knocks in vain at the door of a human soul/conscience. But the weeds and vines growing in front of the door show how long it has been since this soul responded to Christ’s presence. This may or may not be a 4th century representation of Christ. It is a mosaic floor unearthed in the town of Hinton St. Mary, Dorset, England, and seems to show a Romanized man backed by the chi-ro symbol which was used by early Christians to represent Christ. On either side of him are pomegranates, symbols of fertility. 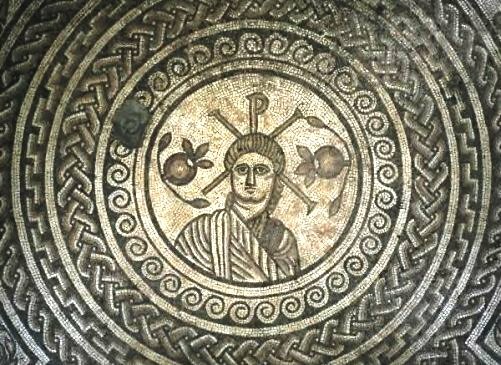 At the time this floor was created Christianity was not under persecution, so it is feasible that a Christ-figure was used to decorate a wealthy house or public area.